Traditional orthodontic treatment has been great at aligning the teeth and achieving a stable and functional bite. The sad truth, however, is that this doesn't necessarily always result in a great smile. Modern orthodontics and more progressive orthodontists such as Dr. Benson also evaluate how the teeth are framed by the lips and position the teeth such that they provide optimal lip support as well as maximizing tooth display when smiling. Caption: While both these patients have straight teeth and a good bite, you can see how much more aesthetic the smile for the patient on the right looks because of the increased tooth display, wide smile, and curvature of the smile arc. This is generally more desirable than the flattened, narrow smile on the left. While Dr. Benson's goal is to always align your teeth and give you a stable, functional bite, her primary goal is to give you a beautiful smile such as the one pictured above, utilizing a treatment philosophy called Smile Arc Protection (SAP). Smile arc protection aims to either preserve the natural curvature of a smile that is already present which tends to flatten during traditional orthodontic treatment methods, or to create an aesthetic smile arc when one is not already present. The goal is for the bottom edges of the top teeth to curve in a line that parallels the curvature of the lower lip when smiling, with 100% vertical display of the upper incisors as well as 10-12 teeth visible. Each individual patient's smile will be evaluated during the initial consultation with Dr. Benson, and a personalized treatment plan will be created utilizing the smile arc protection treatment philosophy. How do we acheive Smile Arc Protection? You may notice that traditional orthodontic treatment involves placing the bracket in the center of the tooth. This is great to align the teeth, but it often has a negative side effect of flattening the smile arc. With the innovative Smile Arc Protection technique, orthodontic brackets are placed on the teeth closer to the gumline in order to create more appealing, aesthetic results by extruding the anterior teeth. By positioning the brackets in this way, patients can receive a broader smile with increased teeth visibility rather than a flattened traditional smile. At The Art of Braces in Las Vegas, NV, Dr. Saoly Benson utilizes Smile Arc Protection (SAP) when treatment planning for all of her patients receiving traditional braces, including clear, ceramic braces as well as removable clear aligners such as Invisalign. The treatment process for SAP is similar to the placement of brackets for traditional metal braces. However, the brackets are placed closer to the gums for optimal results. Prior to the placement, your teeth with be cleaned and polished. The brackets are applied with an adhesive and a specialized blue LED light will be used to cure the adhesive so that the brackets do not move. Lastly, the wire will be placed inside the brackets and secured in place. This initial visit to place the brackets will take about 1 to 1.5 hours to complete. After the placement of your braces, you may experience some slight discomfort in your teeth, gums, and/or lips as you get used to your new orthodontics. It is important that you continue to care for your teeth and your orthodontic appliances by maintaining a proper oral hygiene routine at home, including regular brushing and flossing. We will go over these instructions with you at your appointment as well as discuss which foods to avoid as well as foods that are safe to eat. Additionally, you will need to attend follow-up appointments with Dr. Benson so that she can evaluate your treatment progress and make adjustments as necessary. 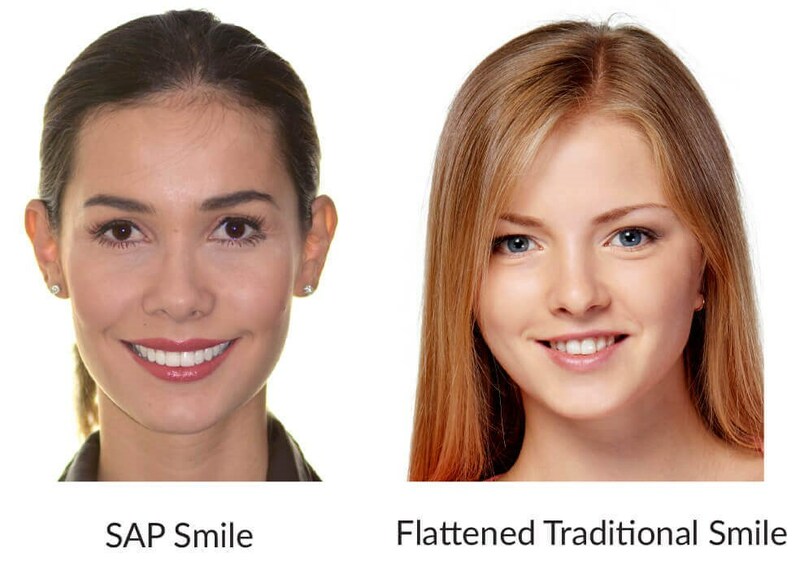 How is the SAP treatment tailored for my specific smile? 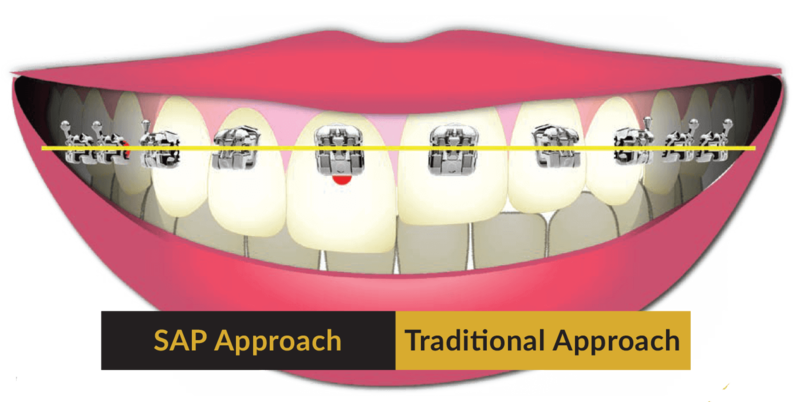 While in most cases, the SAP technique involves placing the brackets slightly higher than normal, the overall bracket positioning may be altered depending on your desired results and current smile. Additionally, your bite may play a role in the positioning of the brackets. For example, if you have an overbite, the position of the lower anterior and posterior brackets can be adjusted to correct the bite. At The Art of Braces, we are proud to utilize the most progressive techniques in orthodontic treatment and embrace the treatment philosophy of Smile Arc Protection in order to create the most aesthetic smiles for our Las Vegas patients. During a consultation, Dr. Benson and her trained dental team will be able to evaluate your current smile and your goals to decide how to achieve your best smile. Contact us today to learn more and to get one step closer to a more confident and appealing smile.